1 Year Official Insta360 Singapore Warranty. The Insta360 ONE X is powered by a removable battery that provides 60 minutes of non-stop video recording. Additional batteries are available sold separately for quick swapping. The Insta360 ONE X is designed with 794 individual components, which together with the included battery total a lightweight 115g. The Insta360 Invisible Selfie Stick for ONE X that come in this bundle is designed to be automatically concealed in photos and videos shot by the ONE X 360° camera. It can be used in all your activities with the ONE X, whether handheld or attached to some kind of support via the 1/4"-20 mounting hole on the bottom. 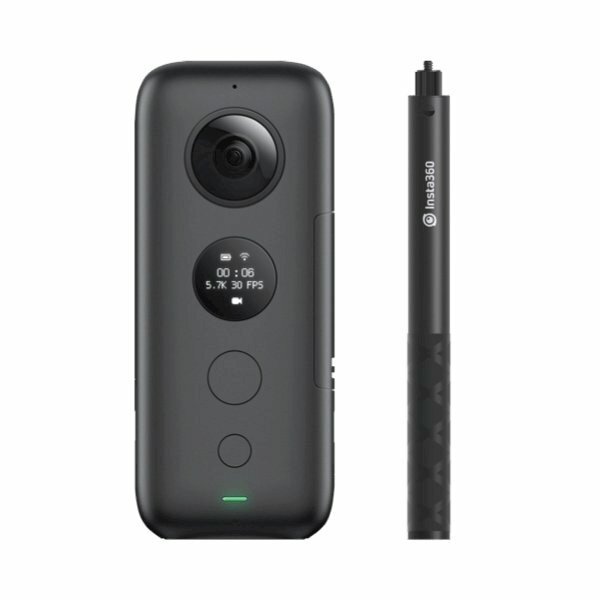 It can also be used with the Insta360 Bullet-Time Handle to shoot Bullet-Time images. The compact selfie stick is made of lightweight aluminum and telescopes from 11 to 47" in length. It provides a 1/4"-20 camera screw on the mounting platform. To loosen the selfie stick in order to adjust its length, twist the handle. To tighten it afterwards, twist it the other way.